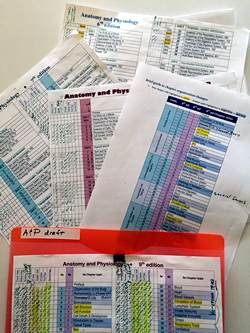 Whether drafting a first edition or revising a textbook, it's a big, complex undertaking. It's not easy to keep track of all the many tasks, most repeated in a particular sequence for each chapter and section. These steps of the writing-revising process can add up to hundreds of individual tasks that could be easily overlooked without efficient tracking. The video below briefly outlines the method that has worked well for me. Making check marks on a workflow progress chart make me happy. I hope you'll find happiness the same way! Please download the handout before watching the video. Click here for the video (if you don't see the player below). Workflow Charting for Textbook Authors from Kevin Patton on Vimeo. This summer, I'll be presenting A Lion Tamers Guide to Writing Textbooks: High Performance with Minimal Injury at the Textbook & Academic Authoring Conference in Providence RI. In the brief video below, I give my loyal readers a preview of that presentation, as well as a "bonus" preview of a second offering that I'm co-presenting at the conference. Lion Tamers Guide to Textbook Authoring PREVIEW from Kevin Patton on Vimeo. Click here if the video player isn't visible above. Note: Be sure to get there in time for the informal reception on the evening of June 8! If I never again see the word "utilize" in a textbook, I'll be a happier man. 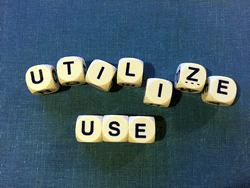 Which brings to mind the word "utilize." I've come to abhor that word. Why? Because those extra two syllables are not needed in most cases. In my opinion. Unless your goal is to sound smarter or "more scholarly." But in my mind, that's exactly what makes it sound a bit pretentious when used in a textbook. 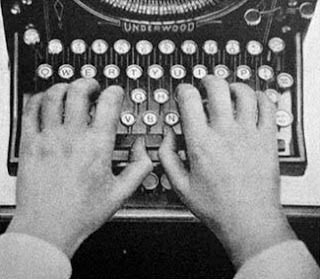 As Joshua Rothman suggested a few years ago in The New Yorker article Why Is Academic Writing So Academic?, using the less "ordinary" language of academic writing may be what's needed to publish in certain journals or gain tenure. Okay. But when trying to help students—perhaps undergraduate students who have challenges of many sorts—why not use "ordinary" language? Why not simply use the word "use" instead? In fact, a while back I did a search of the entire draft of my largest textbook (over 1200 pages) and got rid of every "utilize," save one that was in a quote from American Medical Association. That's how much that word bothers me. In fact, it's a constant struggle for me to watch that my vocabulary remains "ordinary" and my sentence structure avoids unnecessary complexity. However, I think my constant vigilance has slowly improved the quality of my textbooks and, at the same time, honed my skills in writing for students. Again, I know that academic vocabulary and complex sentence structure are part of how educated folk are supposed to write. Perhaps even using unnecessary jargon. But that doesn't make it right for textbooks. Or, at least, it doesn't make it clear. And writing with clarity is essential in textbooks, if not in all scholarly writing. As intellectuals became academics, they had no need to write in a public prose; they did not, and finally they could not. 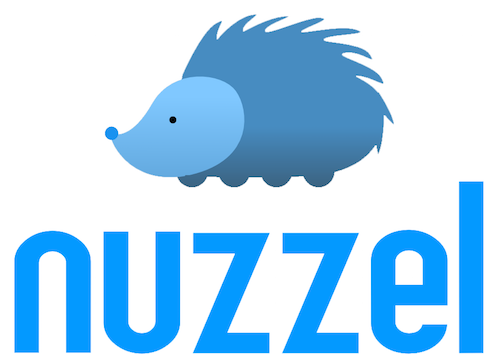 Whether you already have an email newsletter or a social media stream (or two) that relate to your discipline or your textbook(s), you may want to consider starting a Nuzzel newsletter. I have a few blogs going. Some address either students or teachers in my field (or in any field). Others provide updates and insights about specific textbooks I author. And each of them has a related Twitter account, Facebook page, and email newsletter that sends each new blog post by email. This sounds like a lot more work than it is. I have systems that automatically post to my social media streams and email the newsletters out once a blog post is published. So nearly all the work is posting each blog article. Not that this isn't work--it is--but all that other stuff is mostly automatic once it's set up. I never thought that any other layers of social media posting would be useful to me as a textbook author trying to stay connected with--or at least visible to--my present and potential users. But then a former editor started a Nuzzel newsletter, to which I subscribe. It's a daily newsletter. It turns out that his interests--digital education resources--overlap mine. And he's got a good eye for what's new and what's relevant. So I looked into what Nuzzel is and how it works. 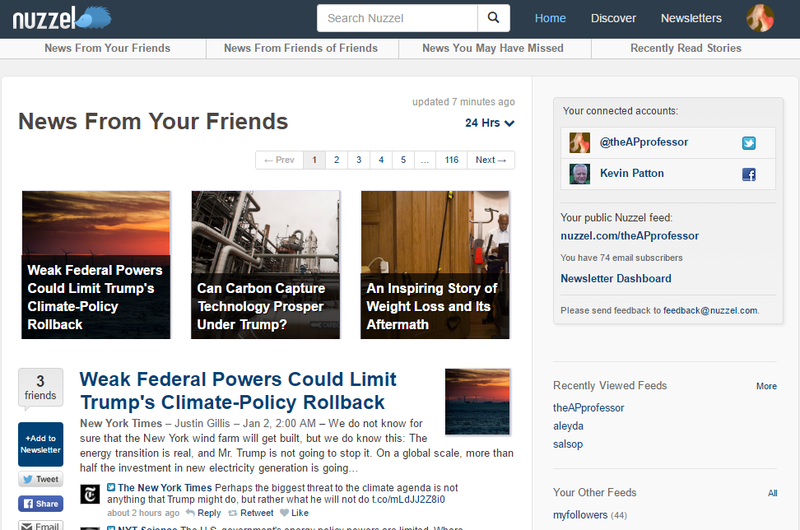 Nuzzel is a free tool that piggybacks on your Twitter account. So you need a Twitter account before you can use Nuzzel. Each day, at a time you specify, Nuzzel sends out a list of headlines that are gleaned from your Twitter connections' feeds. Each headline includes each original article's title, first few lines, image, and a link to the whole article in the original location. Nuzzel will find the articles for you, based on the how many of your connections have shared the same article. You can let it run all by itself, but you have the option of "curating" the content. You can do this be looking at Nuzzel's suggestions and deleting those not relevant to your purpose. 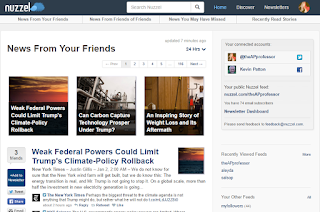 You can add other articles by browsing "Friends" feeds or "Friends of Friends" and other aggregations provided in the Nuzzel dashboard. You can even upload a URL of a news item not found in those lists. You also have the option of adding a comment by any (or all) of the articles that appear in your curated newsletter. You can also add a custom headline each day if it suits you. You can distribute a link to your Nuzzle newsletter to any contact list (Nuzzel will help you automatically load them from your email contacts or LinkedIn, for example). So I started my own Nuzzel newsletter. For my Twitter feed @theAPprofessor, which targets users and potential users of my textbooks. Then I set Nuzzel to post to Facebook and LinkedIn in addition to my Nuzzell subscribers. Nuzzel is super easy to set up and use. My Nuzzel newsletter has been subscribed to by people outside my subscribers in any other channel. That is, it has gained me a wider readership than I had before. I get a lot more re-posting of content than in any other channel. This has helped me grow my Nuzzel readership beyon "the usual suspects" by its wider, organic distribution of individual issues. I often include one "headline" from a past posting from one of my blogs. This allows me to recycle content that is still useful but is easily overlooked by my regular blog subsribers. My recycled blog posts frequently appear in Nuzzel's list of my most frequently read articles for the week. So I know that folks are digging into my blogs, reinforcing my reader ship there. It's easy. Did I mention that? It's not perfect, though. Read on. It's daily--no skipping days. Not even on weekends. you can always just let Nuzzel pick the news to share, based on popularity among your Twitter friends. I found that I prefer to actively "curate" each day's issue before it goes out, because the automatic listing nearly always has stuff that doesn't relate to my purpose. Some folks just have to post something related to politics or celebrities or other stuff that is not relevant to my readers--and if a few of them post the same thing, it may show up in my newsletter. Some news items I find on my own cannot be added to my Nuzzel newsletter. I'm not sure why, but I'm advised that "this is not a valid news item." And nothing will allow me to add it. Some articles get posted in Nuzzel as "Article Not Found" or something similar. Probably an artifact of differing ways that metadata is formatted. But the link still takes you to the article you want. I've found that adding a comment that outlines the title and/or content of the seemingly broken news item is helpful when that happens. Check out past issues of my Nuzzel newsletter here: nuzzel.com/theAPprofessor Click on archive, then look through several. Looking at just one won't give a very complete picture of the potential of Nuzzel. You can subscribe at the same link. It's all about anatomy and physiology and college teaching--but you may find the news items interesting no matter what your discipline is. Greetings on National Author's Day! What better way to celebrate than to begin a journey through a fellow author's work, eh? Here are four books I recommend for textbook authors that have helped form my perspective on writing educational material. Besides the fact that I love Lamott's informal and humorous storytelling, this book is one of the best books by a successful writer on on authoring that I've read. And I've read a few. The title is based on advice given by Lamott's father to her overwhelmed brother when he realized that the report on birds that he had months to write was due the next day. Dad advised, "Bird by bird, buddy. Just take it bird by bird." What textbook author can't relate to that as we start a new project or revision? Make It Stick: The Science of Successful Learning by Peter C. Brown, Henry L. Roediger III, and Mark A. McDaniel. Written for students and teachers in an engaging, nontechnical style, this book identifies some key concepts in how we best learn for the long term. It turns out that there are some surprises revealed by recent learning research that turn some of the long-held ideas about learning upside down. Many of the techniques we have used help us learn for the next test, but do little if anything to help us "make it stick" in the long term. When I was a new teacher, I was SO frustrated that my students seemed to remember nothing from their prior courses. Then I realized that no matter who their teacher or which school they attended before, this was just the way it is. I learned that my energy is better spent getting my students up to speed than to complain about their prior learning. And on changing my techniques to bolster long-term learning. After reading this book, I realized that it's the common methods of teaching and learning, not the failures of prior schools or teachers, that make my students underprepared. It confirmed some of the techniques I'd begun using in my courses and introduced me to others. When we write textbooks, we teach. So I've been trying to adapt the emerging principles of learning science in my writing. This book has been a useful guidebook for that journey. The last two (of four) books I'm recommending today have already been reviewed by me in recent posts, so I'll just list them here and link them to those previous posts. Writing and Developing Your College Textbook: A Comprehensive Guide by Mary Ellen Lepionka, Sean Wakely, and Steve Gillen. This new edition is available for pre-order for a December 2016 release. Short, well-illustrated book that every textbook author should use when reading, negotiating, or re-negotiating a publishing contract. Let's Avoid Using Unnecessary Jargon in our Textbooks!